•	Higher protein and energy utilization along with more deposition of lean meat in breast and thigh muscles in commercial broilers. •	Improve protein synthesis,antibody titres and other immune function along with egg production in commercial layers and breeders. •	More efficient mobilization of hepatic fat with lower concentration of fat and triglycerol in liver along with improvement in meat quality and keeping quality of meat. 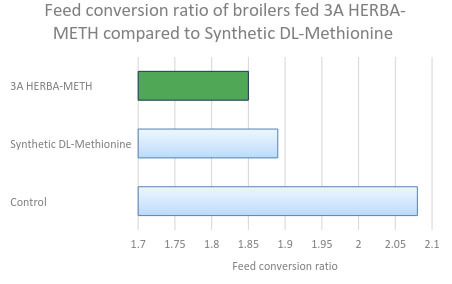 Help to convert hemo - cysteine to methionine for sustained bioavail ability and bio-activity. Help in regeneration of methionine from hemocysteine. 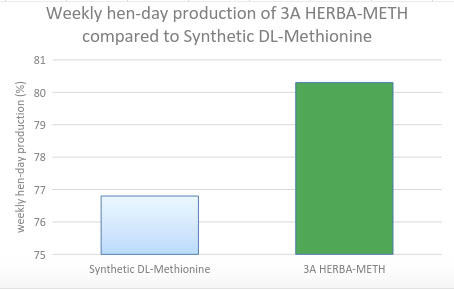 3A protein can be used 100% in place of synthetic dl-methionine in poultry feed,with higher and sustained methionine activity.